NEW! 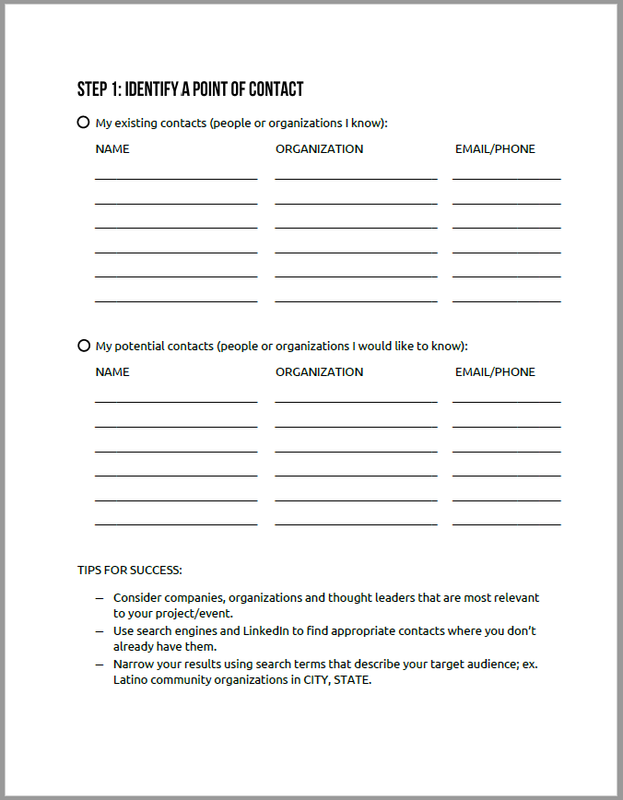 My five-step Event Outreach Checklist is now available for download. Get your copy today to start building better audiences for your upcoming events. If a tree falls in the woods and no one is around, does it make a sound? The same question could be asked of an event unsupported by outreach. Audience outreach is essential to the success of events and experiences. Think of it like a domino effect. If you get the word out, people start talking about it. When people start talking, interest grows. Greater interest leads to greater attendance. Participants tell others about their experience, and the cycle begins again. As Montage’s Outreach and Engagement Manager, I spend my days working with partners to promote the All of Us Journey. My job is to maximize participation and build relationships of mutual-benefit wherein attendees discover the value of precision medicine and we achieve the goal of enrolling one million Americans in a landmark research program to improve public health. My five-step outreach strategy helps tap into every possible opportunity for driving public involvement. It goes a little something like this. First, tap into your connections. My experience in nonprofit health made me a natural fit for a role focused on biomedical research. I bring previous professional contacts as well as familiarity in navigating health-focused organizations. Nine times out of 10, working with someone you know (or someone who knows someone you know) results in a faster and smoother introduction process. Next, look for existing relevant networks. What companies, organizations or thought leaders make sense to team up with? While anyone can participate in the All of Us Research Program, it makes far more sense to connect with a community health center than a motorcycle retailer. Do your research and prioritize the most relevant networks first. I benefit endlessly from the existence of search engines. Exploring the internet based on keywords has allowed me to discover contacts far and wide. Because I am particularly focused on UBR populations (populations underrepresented in biomedical research), I use search terms like, “CITY, STATE community health center” and “Latino organizations in CITY, STATE.” Your search terms should reflect your intended target audience. Now that you have a prospect, it’s time to get in touch. I keep my initial message simple. Whether I’m reaching out over the phone or via email, I always start off by introducing myself. I like to reference any existing connections or mention my familiarity with the individual or organization. Only after proving to be a real person do I introduce the opportunity. I find that folks are more receptive to a flyover view of what I’m offering. Too many details tend to overwhelm. If I am communicating via email, I include links to add legitimacy and facilitate further exploration. Early conversations are as much, if not more, about listening than talking. Figuring out if and how to work together depends on understanding the priorities, needs and conflicts of an ideal partner. Schedule a call or a meeting to capture a clear picture. Start by assessing if a partnership is possible, and be willing to work around barriers. I recently connected with a membership organization about getting their network involved in the All of Us Journey. Members pay dues to receive certain services. By encouraging participation in the Journey, the organization worried that members might perceive involvement as a requirement to accessing their benefits. To avoid confusion, we mutually decided it would be better to shift our audience from the organization’s members to their internal staff. I hadn’t faced a similar problem before, so this situation required me to think on my feet and come up with a solution. Certain individuals and organizations will be more eager and/or able to get involved than others. Subsequent conversations will help you ideal paths for increased involvement. Opportunities might include speaking engagements and media interviews, co-branding of materials and dedicated activities. At the most basic level of involvement, we arm all our partners with a turnkey kit for promotion of their network and community. Templates for a newsletter, press release, blog post and social media messages can be customized by each partner. By adding their information and appropriate brand elements, partners can transform our templates into content that looks familiar and attracts the attention of their audience. I prioritize creating templates for digital platforms. They are more reliable and sustainable. For example, you may reach 2,000 people with a simple Facebook post while printing up 2,000 brochures may get taken or may end up in the recycling bin. The materials in the kit can be used by everyone, however more involved partnerships often want or need more support. Work together to figure out what will be most valuable and create communications that can be used in more than once. If you’re hosting a series of events or experiences, most of what you create will come in handy multiple times. Congratulations! Your outreach has led to a successful partnership. But it doesn’t end here. It takes far more time to make a connection than maintain one, so the latter should be a top priority. Keep in touch with your partners. Check in often in advance of the event. Make yourself available to answer their questions and troubleshoot issues. And notify them as milestones are met. As partners, it’s important to celebrate these moments together. With All of Us being a 10-year project, we know we’re in it together for the long haul. If you need another reason to stay connected, future opportunities should be it. By keeping in touch, both you and your partner become top of mind for each other. It’s always nice to be thought of, but it’s especially valuable when new opportunities arise. Conducting outreach isn’t rocket science, but nailing it takes practice. Download our handy Event Outreach Checklist to get started. And if you have more questions, I’d love to talk with you. You can contact me at kstjohn@montagemarketinggroup.com.